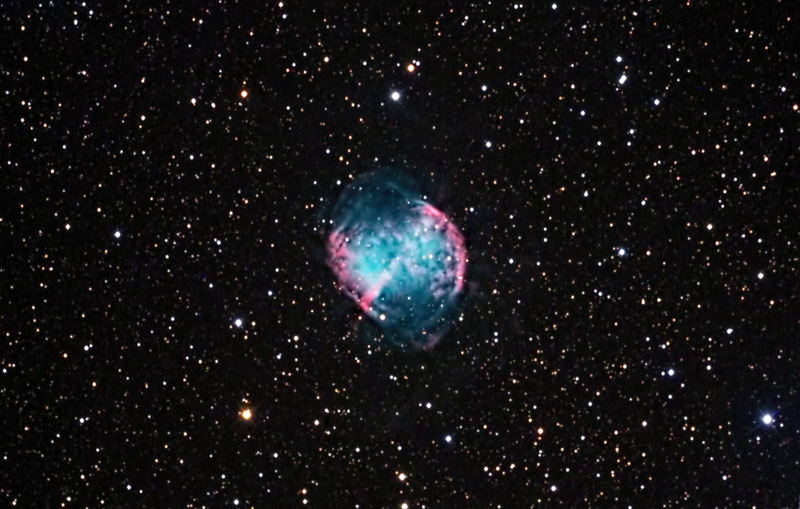 Due to its characteristic shape, M 27 is commonly known as the Dumbbell Nebula. It is a planetary nebula.Planetary nebulae are formed when a star reaches the end of its life cyle. The supply of hydrogen runs out and the star begins fusing helium into heavier elements (i.e., Carbon, Nitrogen, Oxygen). The remaining star becomes a white dwarf, which heats up the expanding material. Ha Images were focused, acquired, reduced, aligned, and combined in CCDSoft. Color images were focused using the camera's live view. The subframes were calibrated, aligned, and combined in ImagesPlus.The Ha and color images were aligned in RegiStar and the composite image was created and adjusted in Photoshop.